Luthiers sans Frontières: training people, supporting communities. Their story in Haiti began in 2008, over a year before the devastating earthquake. Robert Cain, lecturer and luthier at the Newark School of Violin making, went with two students to a school/hospital complex in Leogane, south of Port au Prince, which was being used as the venue for the summer camp of the Holy Trinity Music School, which has provided musical education for around 1400 young people for 40 years. The school organises a three-week residential camp in Leogane for 140 students and the Haitian staff from St Trinity are joined by 20 or so volunteers from the USA who are comprised of professional musicians, teachers, and music college students, some of whom are former students of St Trinity. Recognising that there were many instruments and bows in need of attention and very little expertise in the whole of Haiti, LSF was invited to attend the camp and run a class in basic repairs, fitting-up and bow rehairing. The temporary workshop was established in a disused hospital ward, complete with beds, mosquitoes, mice and rather erratic electricity and water supplies. Six students were taught the basics or repairing and the LSF luthiers divided their time between teaching and doing the more complex repairs themselves, which included rehairing and repairing 63 bows, 2 broken cello necks, an array of bridge adjustments and even repairs of a bassoon, a flute and a few guitars. After this productive week, the team then setup a pop-up workshop in another music school down the coast. As the team prepared to return for a follow-up mission in 2010 to develop the initial training that they had provided, the devastating earthquake hit Haiti destroying the whole St Trinity complex at the expense of 200 lives. After careful consideration, the LSF UK team decided to go ahead with their mission. Although it may be difficult to appreciate the relevance of music and lutherie to a community that has so recently suffered massive trauma, the team observed that life continues to go on in as “normal” a way as possible, with schools, hospitals and businesses functioning in improvised buildings. Many of the tools supplied in 2008 had been lost in the earthquake and others had significantly deteriorated due to the high humidity. New supplies, donated entirely by supporters, were taken out and distributed between three centres and the team succeeded in teaching all students to re-hair bows and complete basic repairs. Students also learnt the beginnings of setting up a violin and some went on to tackle more advanced repairs on instruments damaged in the earthquake. The LSF UK team then went back to Haiti in 2012 and noted that, since the first mission in 2008, the craft of lutherie in Haiti had been transformed. 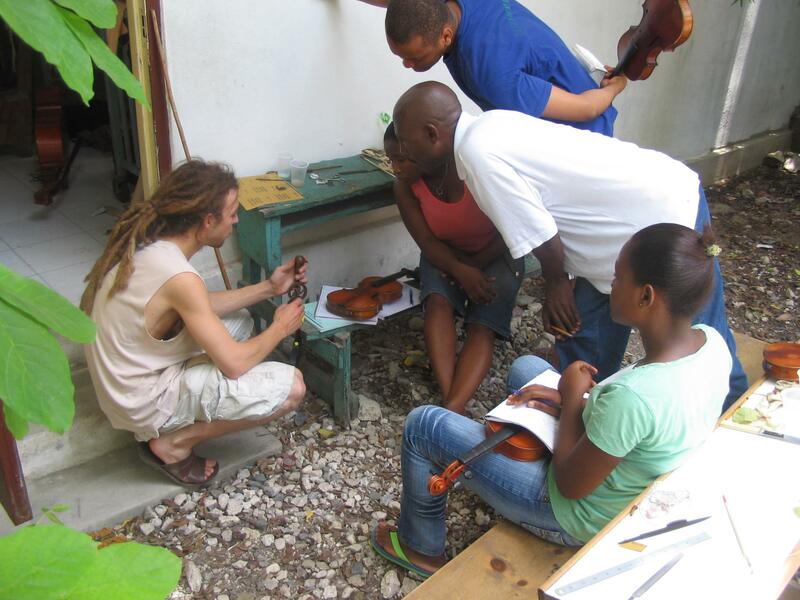 As well as revisiting the summer camp of St Trinity, they spent the second week at the Dessaix-Baptiste Music School in Jacmel on the south coast, which by this point had a substantial workshop and a resident luthier providing a useful service to the music schools. To make these missions possible, the LSF UK volunteers rely entirely on donations of money and materials. Approximately 40kg of supplies were taken on the 2012 Haiti mission, including a donation of fittings and bow hair, used strings, donated tools, some tools and fittings purchased with LSF funds, and additional supplies brought by volunteers. Since 2008, four violins have been made by luthiers in the UK to support the charity through their sale. One of these violins, made in the J&A Beare workshop, will be for sale at our upcoming auction on 13th May 2014. All proceeds from the sale will go directly towards supporting the work of the charity and Ingles & Hayday will donate all commission and Buyer’s Premium earned on this lot straight back to the charity. If you are interested in finding out more about the charity and ways that you can help to support their work, please visit their website or contact them at Info@Lsf-uk.org.